Falcon Charter Bus knows just how important it is for your group to have fast, efficient transportation to and from excursions in New Orleans. Because of this, we make it our duty to provide the safest, most reliable solutions in the transportation industry. Handling everything from sports competitions and weddings to corporate outings and field trips, Falcon Charter Bus is more than equipped to satisfy your group travel needs. Falcon Charter Bus provides around-the-clock service for the city of New Orleans. Committed to providing the most reliable charter bus and minibus rental services in the city, we work with a wide network of providers to bring you the most modern motorcoaches on the market. Whenever you call, we work with you to find the solution that best fits your group. Our reservation team takes the time to build an itinerary around your needs, collecting vital information such as group size and travel destinations before securing the appropriate motorcoach solution and driver. Regardless of where you’re starting or what your group’s destination may be, Falcon Charter Bus Company ensures that you’ve got premier transportation. Falcon Charter Bus specializes in providing private transportation services for groups of all sizes. Private shuttles allow you to arrive on time at your event, avoiding long delays you’re prone to experience when using public transportation, rideshare services, and taxis. Don’t rely on services that can leave you hanging; book a private motorcoach to facilitate your next private excursion. Do you have any students, faculty, or staff in need of fast transport to and from a field trip destination? Falcon Charter Bus loves servicing learning institutions by providing industry-leading solutions for schools throughout New Orleans. Students enjoy riding on private motorcoaches because they’re loaded with premium amenities such as WiFi, restrooms, televisions, power outlets, reclining seats, and more. These features give students the freedom to relax as they make their way to the excursion. Planning on celebrating your big day in the Big Easy? Falcon Charter Bus makes weddings fun and easy in New Orleans, thanks to our proficiency in finding the fastest, most efficient vehicles on the road. Never worry about your guests arriving late or getting left at the New Orleans International Airport when you book with us. Premium entertainment and safety features also ensure that all of your guests arrive safely and on time. Whether you’re an athlete, a coach, or a fan, Falcon Charter Bus can provide the services you need to get to and from your next sports competition. 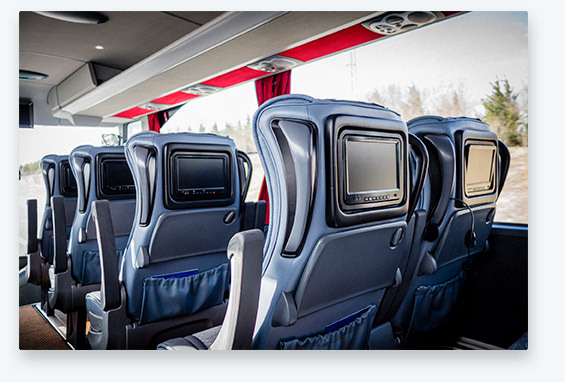 Offering an array of charter bus and minibus solutions to benefit teams of various sizes, we’re able to pair your roster with the perfect solution for your commute. Overhead storage bins and luggage bays give you the freedom to pack as many uniforms, pads, balls, training items, and team supplies as you need. Are you ready to plan your next trip in New Orleans? Falcon Charter Bus makes it easy for you and your group to plan group excursions throughout the city and beyond. If you’re want to learn more about our services, reach out to us at 504-315-2045.